Are you ready to ROC New Year&apos;s Eve 2018? There are plenty of fun things to do in Rochester, NY and the Finger Lakes from a night on the town to family-friendly fun for all. Check out this list of just some of the special hotel offers and events happening to celebrate the start of a new year in the Flower City. Join the City of Rochester for the annual New Year&apos;s Celebration. It all kicks off with free ice skating at Martin Luther King Jr. Park and family fun and games including a dance party, bounce houses, an obstacle course, airbrush tattoos, photo booths, caricature artists, magician and more at the Joseph A. Floreano Rochester Riverside Convention Center. The City of Rochester&apos;s annual firework display is scheduled to launch at 9:00 pm. The best spot for viewing the fireworks will be from the Main Street Bridge. Please note that Main Street from South Avenue to State Street will be closed to traffic starting at 8:00 pm. The Broad Street and Court Street bridges will be closed at 8:30 pm. The 2019 Rockin &apos;N The Garden New Years Eve party package at the Hilton Garden Inn Rochester Downtown includes hand-passed hors-d&apos;oeuvres, prime rib and seafood buffet, dessert display, 5-hour open bar, live band in Drifters Restaurant, DJ and dancing in the Ballroom, champagne toast at midnight, overnight accommodations and buffet breakfast on New Years Day. Ring in 2019 at "Hollywood & Vine,” the most exclusive NYE event in Rochester, NY! Revel in the glamour of old Hollywood, dress to impress and celebrate in signature Strathallan style at the historic Century Club of Rochester mansion (directly across from the Strathallan Hotel & Spa). The event includes an open ultra-premium bar, dancing, heavy hors-d&apos;oeuvres and desserts, champagne toast, access to discounted room rates with purchase of event admission. 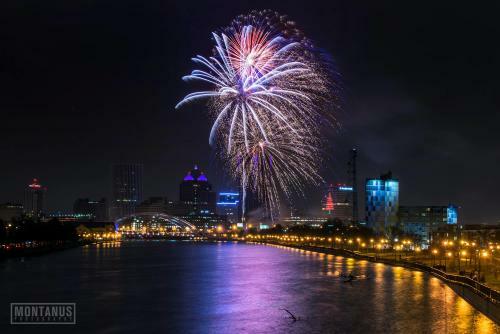 Spend New Year’s Eve in downtown Rochester at the Rochester Riverside Hotel. Book your package now and enjoy 4 hours of open bar, live music, live DJ, dancing, all-you-can-eat hors-d&apos;oeuvres and a champagne toast at midnight! Book a couple&apos;s package here and single package here. Ring in the new year at the highest point in Rochester! Enjoy live entertainment in Horizons Lounge by The Swooners, dinner, open bar, and more with the silver or platinum package. Get on your Gatsby best and party like Gatsby at The Cub Room with a six-course tasting dinner, glass of champagne for midnight, dancing, photo booth, watch the ball drop, and party favors at every table. Join 600 dressed-to-impress friends at City Grill and Ballroom384. Tickets include scotch & bourbon tasting, champagne tasting & Moscow mule station, premium open bar, passed appetizer station, dessert station, champagne toast, live entertainment, and NYE swag. Close out 2018 and ring in the New Year in style! The Penthouse at One East Avenue in partnership with Out Alliance, The Bachelor Forum and The Avenue Pub is proud to present a New Years Eve Extravaganza! The Great Gatsby themed event will feature DJ Hector, Drag Queens AND Kings, food, drink specials, WNY Ballroom LSS demo and more! The Capitol Steps return to the Nazareth College Arts Center for a New Year’s Eve tradition of politically based satire ripped from current headlines! Get your tickets for one of two showings. Enjoy a special dinner at the George Eastman Museum before screening the film, The Red Shoes, in the Dryden Theatre. Whether there&apos;s snow or not, Bristol Mountain Resort is going to ring in the new year with fun activities to delight the entire family. You don&apos;t have to be a skier to enjoy the last night of the year 2018 at the mountain. There&apos;s plenty for everyone to enjoy. Torchlight parade and fireworks will be on tap. Join Farmer&apos;s Creekside for an evening of fine dining, champagne, and fireworks! Local shops will be open, purchase warm drinks and, "Ooo & Ahhh" at the Le Roy fireworks from the best seat in town! Ring in the New Year at del Lago Resort & Casino! Experience the thrill of the gaming floor with a chance to Win Free Play For A Year. Plus, you’ll enjoy a night to remember with live entertainment from Classified at The Vine, and a variety of entertainment wherever you choose to unwind. Check out our award-winning dining options including Portico By Fabio Viviani, Farmers Market Buffet and MORE! Wherever your holiday travels take you, Visit Rochester wishes you a Happy New Year, and we look forward to you visiting in 2019!